Joint replacement surgery, also called arthroplasty, involves removing the damaged portion of the hip, knee, shoulder, ankle or toe and replacing it with an artificial joint that allows for pain-free movement. When performing knee replacements, Drs. Baker, Hansell, Braut, and Schroering use Verilast® materials and Visionaire® patient-matched technology to create the strongest custom-made replacement possible. Revision surgery is performed to remove a previously implanted artificial joint and replace it with a new one. Revision arthroplasty may be necessary for a number of reasons. The artificial joint may loosen, infection may develop in the joint, one of the bones around the joint may be fractured, or part of the implant may break or wear down over time. Unlike traditional total joint replacement, joint resurfacing does not remove the bones in the joint, but instead resurfaces the bone with smooth metal. Hip and knee resurfacing conserves bone and is a less-invasive procedure than total joint replacement. 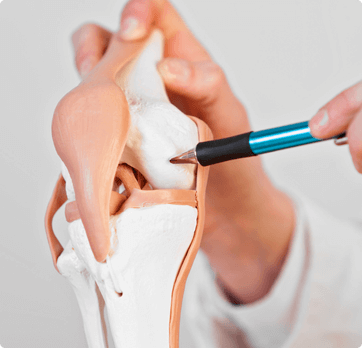 Our doctors will thoroughly evaluate your condition and may perform Arthroscopy to help determine which surgery or type of artificial joint is best for you. Don't let joint pain hold you back from what you love to do! Call Associates in Orthopedics today at (941) 637-BONE (2663) to learn more about joint replacement and joint revision surgery in Punta Gorda, Florida or request an appointment online.